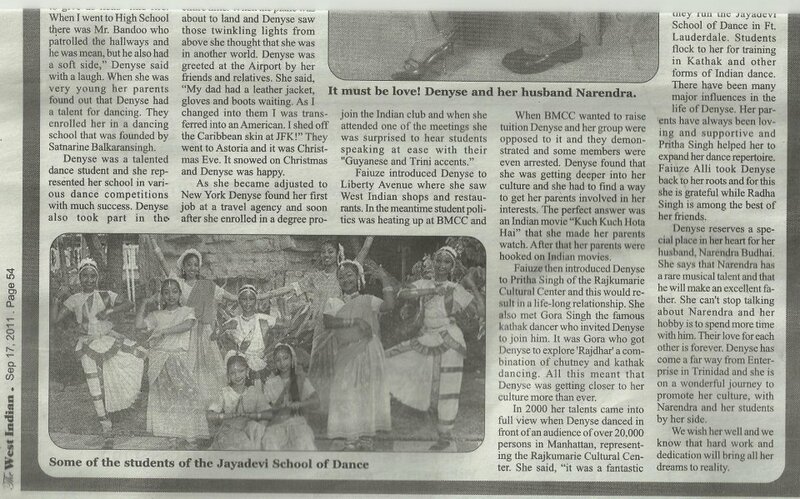 Articles and Reviews - J A Y A D E V I Arts Inc. - "Preserving IndoCaribbean Arts & Culture"
A recurring dream of dancing with the revered goddess of the Hindu culture, with her ornate attire, sparkling jewels and spirited ritual dancing, sparked Plantation resident Denyse Baboolal to share a passion for dance with both young and old. This dream became reality in 2008, when Baboolal opened Jaya Devi Arts, Inc. (JAI). Children and adults shared the same class and learned to dance such spectacular performances as Chutney, Lucknow Kathak, the Spoken Word and Dholak. The name “Jaya Devi” means “victorious goddess” and pays homage to the strength and commitment of the Hindu divinity. It is this strength and an equally strong desire to keep tradition alive in her new hometown that led Baboolal to teach at her studio. After 17 years of serving as a dancer, choreographer and director at the Rajkumari Center for Indo Caribbean Arts & Cultural in New York, a newlywed Baboolal relocated to Florida with her husband. “It is customary in the Hindu culture that a woman moves to wherever her husband’s job is located,” she explains. What began as a dance school to teach both traditional and popular Indo-Caribbean dance forms soon transformed and grew into a non-profit 501 c(3) artistic center where influences of Indo-Caribbean communities from Guyana, Trinidad, Jamaica, Suriname and other Caribbean locales can learn and share together. Master artists from around the world come to share their experience and weekly classes in dance, arts and crafts are held for all ages. Her goal is to have these arts learned harmoniously to save what has been dying out among the newer generations. Workshops, classes, performances and events are all now integral parts of JAI. Most recently, the organization received a grant from the Broward Cultural Council to help it present many events that are as unique as they are important to the preservation of Indo-Caribbean arts. Historically the tadjahs were released into the waters off Trinidad after such a processional; however, Baboolal has bigger plans for the floats. “We hope to share these magnificent tadjahs with the community by having them on display locally for a few months,” she explains. She has reached out to area museums and cultural groups to find a suitable location for their display. In the works for the future of JAI is collaboration with local women’s groups to help those of Indo-Caribbean culture work through the challenges of daily life. Through an in-house support group and a combination of activities and artistic endeavors, called Nari, Baboolal and others are able to “empower others to rise above abuse and allow them to vent their frustrations.” She hopes to bring this service, along with the rich dance, arts, music and culture to the entire Broward County and surrounding communities. For more information about Jaya Devi Arts, Inc. please visit the organization’s website at www.jayadevi.weebly.com or contact Denyse Baboolal via email at jayadeviartsinc@yahoo.com.